Dumfries & Galloway is one of the most scenic regions in the UK, but children and families living there can face a lack of opportunities to lead an active and healthy lifestyle due to the challenges of rural isolation and deprivation. Scottish obesity data 2016/17 indicates D&G had the highest percentage of children in Scotland at risk of becoming either overweight or obesity, at 29%. Less than one in five children and young people meet the recommended levels of physical activity. Working in close partnership with Triathlon Scotland since 2015, our local coordinator Rebecca delivers triathlon activities in local schools, sets up after-school triathlon clubs and organises family-friendly swim, bike and run events. 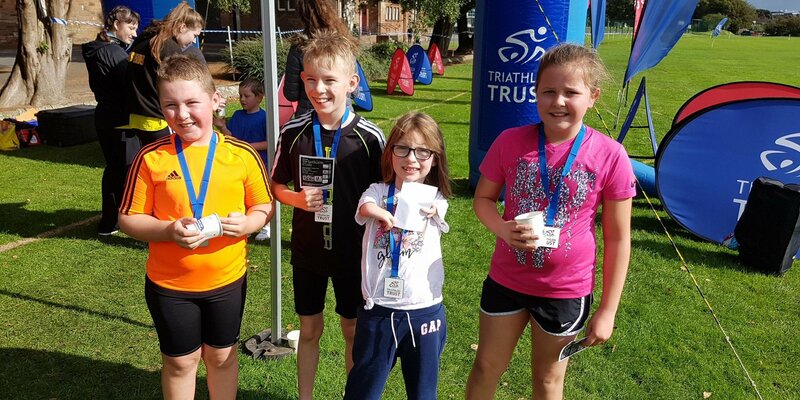 An annual series of mini triathlon events held in four towns across D&G provide a fun, free and fully inclusive introduction to the sport of the triathlon for local schoolchildren who might not otherwise have the opportunity. The project also engages recruits and develops volunteers from the local community and equips young people, through the Young Person TriActivator course, with the skills and knowledge to lead activities in their own schools and communities. This project has been delivered in partnership with, and through the generous support of, the Holywood Trust, Garfield Weston Foundation, ScotMid Co-operative's Community grants, Aldi UK Scottish Sports Fund, Westsound Cash for Kids, and SSE Clyde Dumfries & Galloway. Click here to view an independent evaluation report of the Triathlon Trust's work in D&G conducted by Dumfries & Galloway Council Health and Wellbeing Board.